Because a kiwi bird is our logo, it only seemed appropriate to actually help a kiwi out. Many of you guys, when you come over to New Zealand to start a working holiday, have “seeing a kiwi” on your New Zealand bucket list. Unfortunately, they aren’t the type of birds that just wonder up to you on the street. In fact, the population is declining so rapidly that they could be gone from mainland New Zealand in our lifetime. That’s why we are supporting Kiwis for Kiwi, and in particular, our own little kiwi bird called Smaug. We named our Kiwi bird “Smaug” after the dragon in The Hobbit for his fiery behaviour. Smaug came into our lives when we went to do a health check on him in Sanctuary Mountain Maungatautari. But before we could come face-to-face with the kiwi, we learned exactly how kiwi birds are protected and how charity funds are being used. 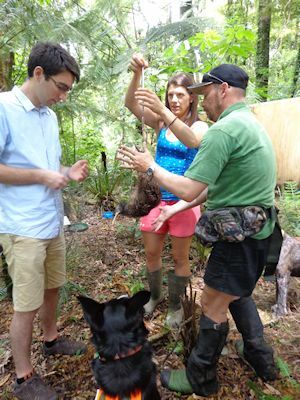 Mark Lammas, a kiwi practitioner funded by the WWF, finds young kiwi and eggs in the wild with the help of his tracker dog, Bella. Bella sniffs out the kiwi and gently guides it over to Mark. Then, the kiwi is looked after in an enclosure until it is healthy and old enough to look after itself in the wild. 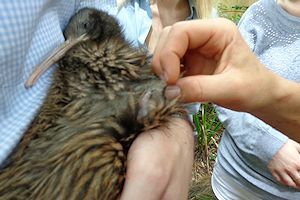 This increases the kiwi’s chance of surviving in the wild, as 95% of chicks die before they reach breeding age in an uncontrolled environment. 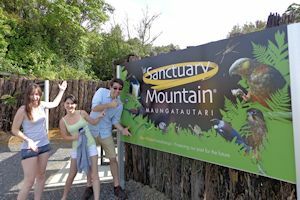 By releasing the kiwi into a controlled environment free of predators, like Sanctuary Mountain Maungatautari, it stands a much greater chance of breeding to increase populations, and living a wonderful kiwi life. Once we got to Smaug’s enclosure inside the Sanctuary Mountain Maungatautari forest, it was time to see if he was ready to face the world alone. After checking his beak measurement, weight and feather sample, Mark decided that, indeed, he was ready! 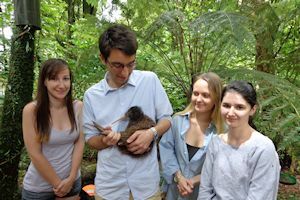 Before handing Smaug over to Sasha Donald, another kiwi practitioner whose job was to release Smaug into another location, the Waimarino Forest, in order to spread some different kiwi genes, we had one last cuddle with him. Goodbye, Smaug, and see you in March for another check-up! You can track Smaug’s progress on Backpacker Guide NZ. 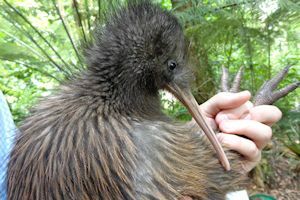 Read how you can help save kiwi birds like Smaug, while you are backpacking around New Zealand, by reading 5 Ways to Save a Kiwi Bird.